I like sci-fi movies and I like watches, so it was a rare treat for me to see these two elements combined. For Hamilton, this isn’t the first time the brand has played a part in blockbuster. In fact, titles like 2001: A Space Odyssey, and Men In Black have both featured Hamilton timepieces. Throughout its movie career, Hamilton has favored films that incorporate science, and more specifically, space exploration. So with that in mind, Interstellar wasn’t a stretch for this Swiss made brand. I’m not going to talk about the movie – except to say that it was good. What I am going to talk about are these fine watches that Hamilton created for the movie. So let’s begin. 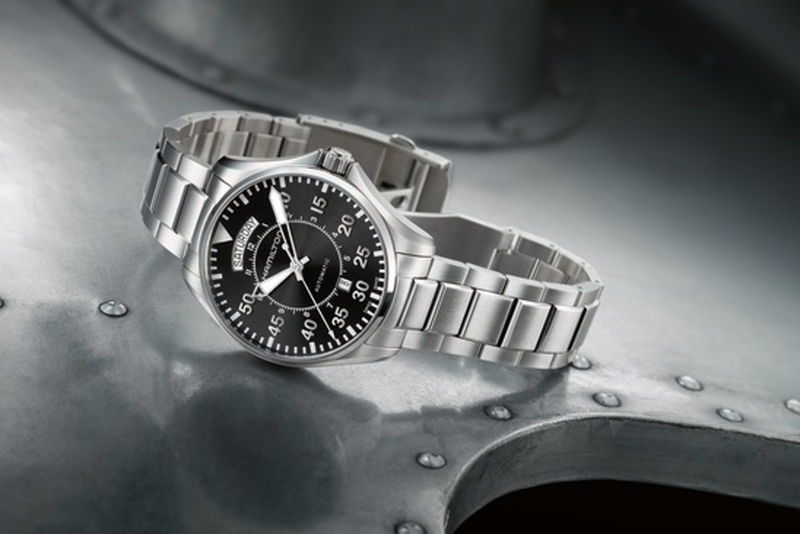 There were two watches made for the movie – a pilot-styled watch that was on the protagonist’s wrist, and a custom made watch that combines various elements of Hamilton’s style of watchmaking. The latter model was called the “Murph” and was only produced in a limited series of 10 pieces for use in the movie. Each of the watches was returned after filming and Hamilton had a competition to giveaway one of these watches to a very lucky winner. It wasn’t me, but not for lack of trying I assure you. The watch that was on the wrist of Matthew McConaughey (Cooper) is actually the Hamilton Khaki Pilot’s Day-Date. This model is featured in stainless steel with a 42mm case diameter. The dial is black and it features Arabic numerals from 5-60, where usually the hour markers would be. The hour markers occupy an internal scale. The hands are rhodium toned and carry lume, so that the time can read in the low light conditions of space. At the 12 and 6 positions are the day of the week, and the date aperture respectively. Powering this watch is a Swiss made self-winding caliber ETA 2824.